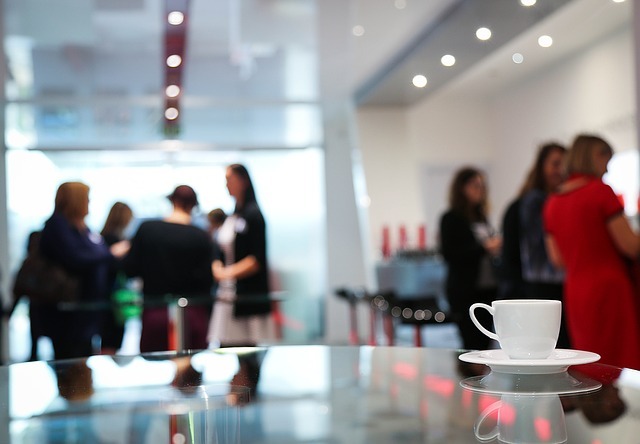 Love them or hate them conferences are often a necessary aspect to working in academia. One of my big fears of attending conferences isn't speaking in front of people or getting bored. No, my biggest fear anymore is forgetting some kind of technology that I need to have an effective conference. So, what to bring? Well really, it can often depend on who you are, what your purpose is, and what you want to get out of the conference. 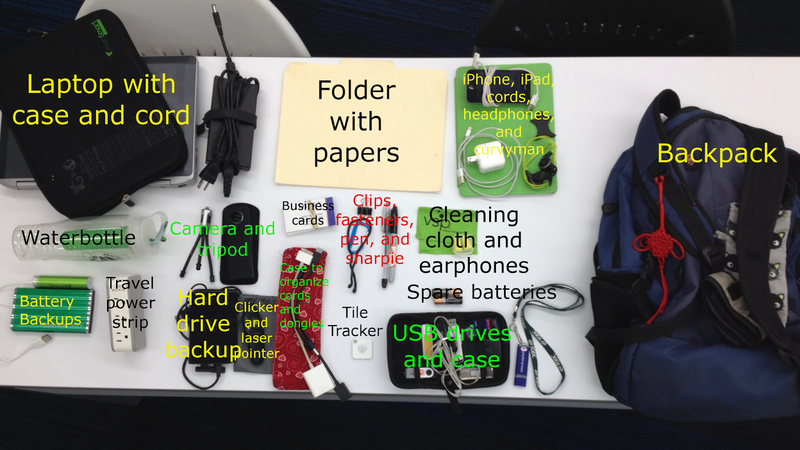 If you are more of a minimalist and aren't presenting you might not bring much more than a smartphone and a charger. If you really enjoy lots of gadgets (like me) and are presenting, you might bring several different devices and lots of options to cover situations that might happen. I suspect that most people fall somewhere in between. I've created a list of tech packing possibilities below that might help you decide what to take according to your purpose or needs. Some of this equipment may seem redundant. Why do you need a laptop and a tablet? Why have a plug adapter for the USB cable to my phone when I can just use the laptop to charge it? I tend to live by the Boy Scout motto "Be Prepared". While it may seem like extra stuff to carry, it can also provide you with a lot of flexibility. For example, I could leave my laptop in the hotel room (securely stashed away) and use my tablet for general conference activities and then use my laptop in the room in the evening. Depending on you and your situation, you may not need everything on my list but this will give you some ideas. At the bottom, you will find some additional tips and tricks for getting the most out of a conference. After all, if you have to attend you may as well try and get something useful out of it. I have also made a printable checklist https://goo.gl/ztNRsh that you can use for your convenience. Keep in mind that these ideas are based on the conferences that I've attended (mostly tech and educational) and you may find the culture and needs different in your field. Also, I link to several products, but I am not endorsing anything. They are just mentioned for convenience sake and there are many comparable products out there that you may want to use instead. Decent travel bag or backpack- Yes, you will probably receive a conference bag. Yes, they are mostly useless for anything more than carrying conference swag. Having a good bag keeps your things organized and makes it easier on you. Laptop- Fully charged and software updated. Make sure you update your software a few days before the conference and that you try all the programs that you will be using before you go. Nothing like doing an operating system update and later finding out that the app you wanted to use no longer works. Laptop carrying case- Things can get banged around and it's good to have a little extra protection if you don't normally use one. Smartphone- Fully charged, updated, and backed up. Tablet- Fully charged, updated, and backed up. USB power plug for your phone and tablet- While most airports, hotels, and some conference centers have USB outlets, they may not or you may need to get power from a wall. A travel power strip such as the one made by Belkin- This can serve two purposes. First it can supply you with extra outlets and it can give you some wiggle room if all the outlets are taken. Simply ask a person using an occupied outlet if you can swap your strip with their power cord and then plug in their cord to your strip. You both win. A battery power bank for charging any of your devices- Sometimes you get in a situation where you can't get access to an outlet and need to charge your device. This allows you the option to keep a device powered up. There are small ones and large ones, decide on one that fits your needs. An extra USB cable- You never know when you might need an extra one because of misplacement, damage, or accidents. Extra pen/pencil- It is also nice to have a permanent marker, like a Sharpie handy. Business cards- While many people can exchange information via smartphones, it's nice to have some of these on hand. Post-it notes- Your choice. Often you will get some at a conference, but I like to bring a small pack just in case. A piece of paper with conference contacts and other information- Comes in handy if you loose your phone. A few extra clips for attaching things- I like to use carabiners and rubber twist ties. Microfiber cloth- For cleaning dirty screens/glasses. Curvy Man- To use to wrap cords around. Spare batteries- If you have anything that requires something like AA batteries, either make sure you install fresh batteries or bring a few extra along. Water bottle- It is nice to have one to avoid over priced drinks and it's more likely that you will stay hydrated if you have something on you to fill up at a drinking fountain. Lanyards- I use these for USB flash drives. I find I am much more likely to keep one if I attach it to a lanyard. Earplugs- You never know if a hotel is going to be noisy or not. Earplugs can help you get some sleep. Just make sure you use an alarm that vibrates so that you wake up. Small cases- I find these invaluable for keeping flash drives, cables, and little parts organized. USB flash drive with any files that you may need- That way, if something does happen to your laptop you may be able to borrow someone else's. Dongle- If your laptop,tablet, or phone needs a special cable to attach to a projector that you may be using during your presentation. Often Apple products will need one, but there may to other equipment out there nowadays that require one. This should have been made clear to you in the presenter information that you received from the conference. Most projectors will accept VGA connections, but some newer ones may do HDMI. If unsure, double check with the conference contacts. Folder- With handouts and presentation outline if needed. Laser pointer/clicker with fresh batteries- There is nothing worse than trying to use a clicker and the battery is dead. Have at home a current backup of your computer on an external drive. If something happens to your laptop at least you have a recent copy at home that you can install on another computer. In extreme cases, you could have someone overnight this to you if needed. Files that you will be using at the conference backed up to some cloud storage service like Drive, Box, or Dropbox. This will give you another option if something happens to the device that you were planning on using during your presentation. Portable mini projector- Sometimes conferences don't communicate very well what presenters are required to bring or maybe the projector suddenly malfunctions. This will give you an option. Bluetooth speaker- Headphones are great, but a speaker allows you to share with others. These are often light and compact nowadays. Blank USB flash drive- You can use this to let someone borrow or to place in other people's computers at the conference. If someone has a virus, you won't compromise your other files by using this one. Camera- While phones these days take excellent pictures, having a dedicated camera can be nice and will allow your phone to be used for other things. Mini tripod- Good for taking better pictures and videos. What conference should you attend? I personally get more out of small regional conferences than big international ones. Big conferences are often overwhelming and it is hard to take it all in. I remember the first International TESOL Conference I went to where the program book seemed an inch or so thick and I spent several hours just going through it trying to highlight everything I wanted to see. I've found regional conferences much more personable and intimate where I've felt I've gotten to know people better. Plus, your money will go further. Consider going to several smaller conferences every year and one of the big ones every other year or so. Consider using a product like Tile for your devices. Conferences can be confusing, distracting, and tiring. It's easy to misplace or forget something and these can give you a little extra piece of mind and security. Take 10-15 minutes before getting started to reflect on your plan for the day. What is your schedule like? What are you planning on doing/seeing? If you are presenting, do you have everything you need before leaving your hotel room? Have you set aside a little time before your presentation to go over it one more time? If you are presenting, take 10-15 minutes to reflect on it and jot a few things down. I know, usually we give a big sigh of relief that it is over and want to go on and have some fun. However, by just taking a few minutes to reflect and write some of your thoughts down it can go a long way to helping you improve and prepare for future presentations. Take 10-15 minutes at the end of the day to reflect on what you did. What did you see? What did you like? What concerned you? Any particular points in a presentation that you heard jump out at you either to possible topics or things you would like to follow up in the future? Who did you meet? The week after the conference spend some time looking at your reflections and come up with a more formal report that could either be posted to a blog, sent out to colleagues, or submitted to your department chair. This helps distribute the knowledge that you gained and lets people know what your interests may be. In addition, the report or posting will help you cement ideas and topics that you may want to pursue in the future. Also, follow up with any contacts that you made. Neither of these things have to be wordy, but establishing a post conference connection to people you met there, will make it more likely that you contact one another in the future. Consider doing some sightseeing. 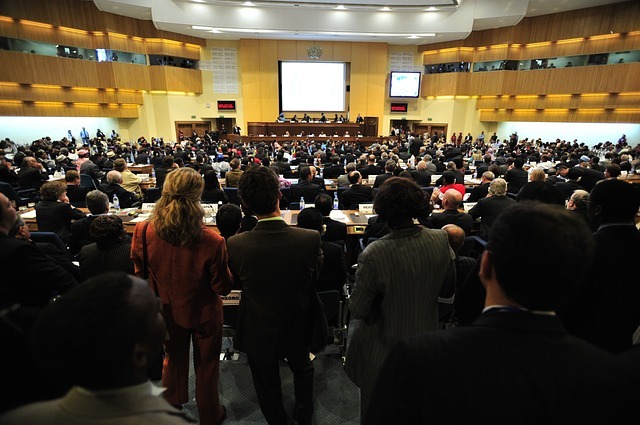 Conferences are often held in cities you haven't traveled to before. Get out and do some exploring and enjoy some time away from the conference. If you are looking to explore some more thoughts and ideas on conferences, a friend and former colleague Dr. Ryan Straight, Assistant Professor of Educational Technology at the University of Arizona has created a podcast on this topic. Check out the New Professor and see what he has to say about them. So, what kind of tech do you bring along to conference? Any other tips and tricks to add? Post them in the comments. In TWIST Bianca Woods wrote a post on Community Recommendations: What Do You Bring With You to a Conference? There are a lot of good ideas here. Besides all the tips, I found Shannon Tipton's post It’s 2018, What’s in my Conference Bag? interesting because she has done several throughout the years and it's neat to see her changes. I'm one of those people who loves conferences! Many years ago I went to my first, an ISTE conference, and would have loved your list. I was so overwhelmed with what I should or should not bring.